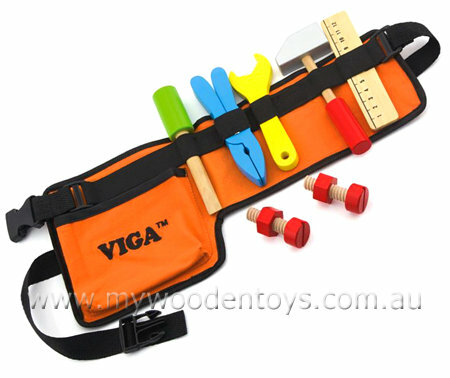 Tool Belt With Wooden Toy Tools is a brilliant role-play toy which will have the little handy-person at your house getting on with all those DIY jobs. This tool belt has and adjustable strap with a plastic click together fastener, a pocket to carry nuts and bolts and elastic loops to hold the tools in place. This lovely set comes with a hammer, wrench, screwdriver, pliers, ruler and 2 nuts and bolts. Get ready for some fixing at your house. Size: The orange part of the belt is 36 x 18 x 25cm and the adjustable strap approx the same length. Material: Nylon Wood Child-Safe paint. We like this because: "Does it get any better that a tool belt?. "